After a two year gap, Pixar made a triumphant return to big screens a few months ago with the magnificent “Inside Out,” a funny, heartfelt, beautiful, film which should be the pole-sitter for this year’s top animated film (and it could even be nominated in the Best Picture and Screenplay category — yes, it’s that good). 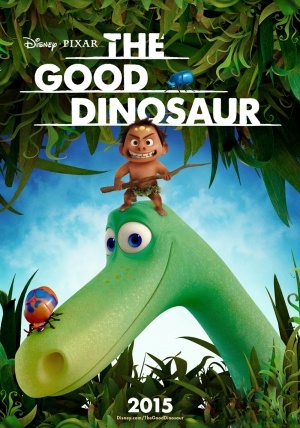 And despite a spate of pretty good movies of this genre (“Shaun the Sheep” and “Minions,” to name a few), the only thing could possibly defeat “Inside Out” would likely be The Good Dinosaur, the second film from the studio this year. The movie’s plotline answers the question what if Earth was NOT hit by the famous meteor that supposedly wiped out the dinosaurs approximately 65 million years ago. Here, the large reptiles have evolved to the point where they farm crops and live in houses (don’t ask me HOW this is possible, however, just go with it). Arlo (voiced at first by Jack McGraw, then Raymond Ochoa, “A Christmas Carol”) is the runt of a litter including big sister Libby (voiced by Maleah Nipay-Padilla, “Fruitvale Station”) and Buck (voiced by Marcus Scribner, “Black-ish” TV series), the strong, but cruel elder brother, as well as Poppa (voiced by Jeffrey Wright, “The Hunger Games: Catching Fire”) and Momma (voiced by Frances McDormand, Academy Award winner for “Fargo”). Arlo is scared of everything (including insects and small “critters” of all kinds) and hinders all chores on their corn farm, and eventually is thrust into the fearful world beyond their quiet land, where his father meets a “Lion King”-like demise, forcing the unprepared dinosaur to fend for himself to get home. Well, ALMOST by himself. On this incredible journey, he is joined by Spot (voiced by Jack Bright, “Monsters University”), a human with dog characteristics and an attribute that Arlo lacks: Bravery. Spot is afraid of nothing, protecting the beast (who had saved the little one’s life before) and even providing food for him. Pixar, which provides richly-written characters as it does wonderful animation, does it again here as the bond between human and dinosaur slowly grows from hate to grudging acceptance to love as the two face increasing dangerous ordeals on their way back. And while some may find elements of “Ice Age” and “How to Train Your Dragon,” among other films here, the story remains mostly original and stripped down to it’s most simple and basic heart. Sometimes, though, this simplicity can lead to Arlo and Spot being overwhelmed by the supporting characters, including Steve Zahn (“Dallas Buyers Club”) as Thunderclap, the leader of a group of ferocious Pterodactyls and Sam Elliott (“Justified” TV series and the iconic cowboy character in movies like “The Big Lebowski” and “Thank You for Smoking”) as a Tyrannosaurus rex who herds long-horn bison with his two kids. Fortunately, the duo manages to overcome most of the obstacles set before them before the bittersweet ending (which may bring a few throat lumps and tears, but not enough to equate it with “Inside Out” or other more deeply emotional Pixar productions). Watch it mainly for the outstanding artistic visuals, though, as the swirling waters, majestic mountain peaks, wooded wonderlands and other marvelous vistas showcase just why this studio is so respected. Some may wonder, however, why the artists here created such gorgeously lifelike landscapes for Arlo to journey across while rendering the dinosaur in a simplistically cartoonish way, even while the other characters seem to be fleshed out much more lifelike (Arlo reminded me a little of “Dino” from “The Flintstones” TV show). I suppose that would be my one tiny problem with director Peter Sohn’s production. It’s not enough to keep me from recommending The Good Dinosaur, but it may be enough to give Academy voters pause when it comes time for them to cast their Oscar ballots. After Inside Out, The Good Dinosaur is a total let down. The canvas is great to look at but the story is trite and I couldn’t associate with either of what constitutes the main characters. I don’t get the cartoon dinosaurs. Life-like dinosaurs are scary to the children. Think of the children! I’ll let my wife take the kids to see this one. I’ve outgrown my dinosaur fascination decades ago.